In her most recent work, Angie Jennings propels the confines of traditional notions of drawing and painting, narrative, performance and self-portraiture. Using yarn dipped in acrylic paint to render fluid contour lines, Jennings reconstructs from memory gestures and actions made during performances she enacted in 2014 including D Extended + Servitude, Dolls at Play, and Walk Over Me. 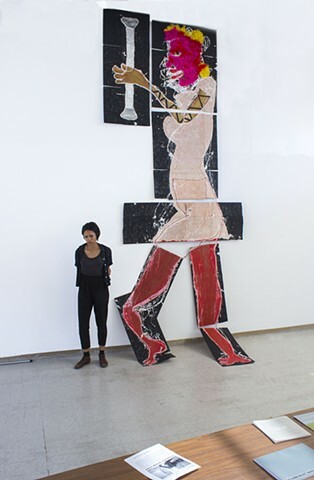 The paintings are made on a multiplicity of cardboard surfaces that are held in place by the paint dipped yarn allowing for the figurative scales to be expanded and collapsed. Implicating surfaces of the performance document, these new works expose tensions between material aesthetics, spontaneity, memory and humor. As in so much of her work, Jennings continues to navigate commanding yet unassuming modes of subversion.